In May 1904, ten yards beyond a barbed wire fence in the East Billerica woods, James Marnell stumbled over a small mound of dirt, uncovering an ornate silver serving tray. “Sanborn’s treasure!” Marnell, a railroad worker, excitedly deduced. Townspeople knew Sanborn’s treasure to contain silverware, jewelry, and furs stolen the year before from Billerica’s plush Talbot and Holden estates and valued at some $10,000, a worthy sum when $13 was the average weekly wage. 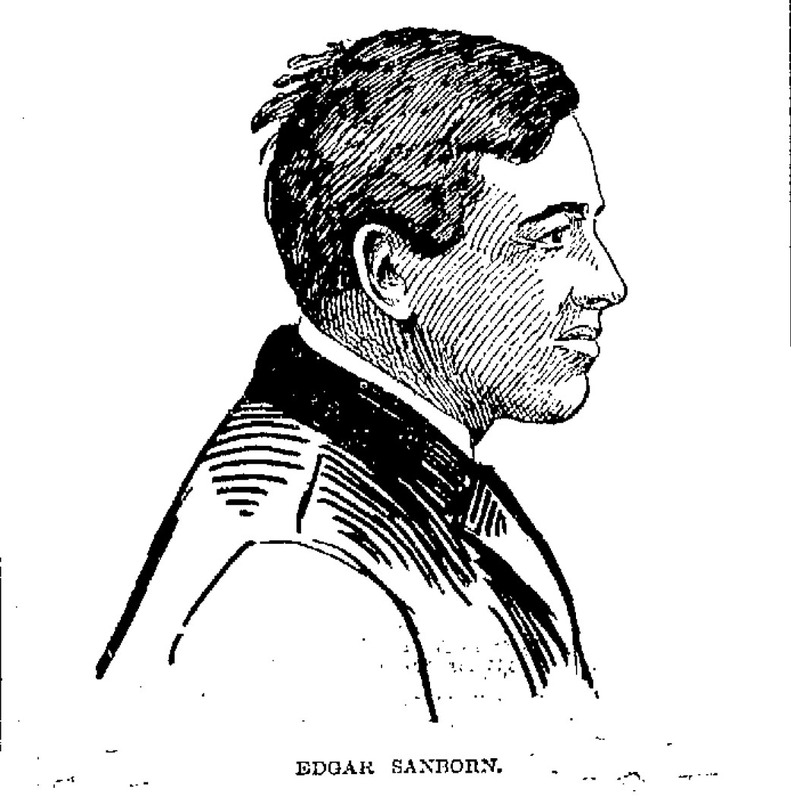 Two months before, Edgar Sanborn had confessed to ten high profile heists in five cities, including the Talbot and Holden burglaries, spanning a six month period beginning when he escaped from the Insane Asylum in September 1903. He was also wanted for an arson of the Auburn railroad station house in that Worcester suburb. A cunning negotiator, Sanborn had won a high price for that confession. Held for breaking and entering in Mt. Holly, NJ, law enforcement officials there had not yet determined his true identity when they began sending circulars to local police departments to determine if he was wanted elsewhere. Some police departments of the time saw these as excellent opportunities to enhance their salaries with bonus reward monies. One such circular found its way to Worcester police officials, who contacted Mt. Holly about their captive, who they believed to be the Sanborn they wanted for arson and burglaries in Massachusetts. Mt. Holly officials were quite responsive to Massachusetts inquiries until they learned there was no reward offered for Sanborn’s return to Massachusetts. Enter Sanborn’s stellar negotiation skills. For his written confession to the burglaries and arson, Sanborn gave Deputy Sheriff Fleetwood and NJ State Detective Parker his personal assurance that he would lead them to the site of his buried plunder. And surely the Talbot and Holden estates would pay a reward for the return of their stolen valuables and heirlooms. Fleetwood and Parker graciously (and promptly) accompanied Sanborn to the family’s East Billerica homestead – so prompt, in fact, that they did even notify Massachusetts that they were returning Sanborn. 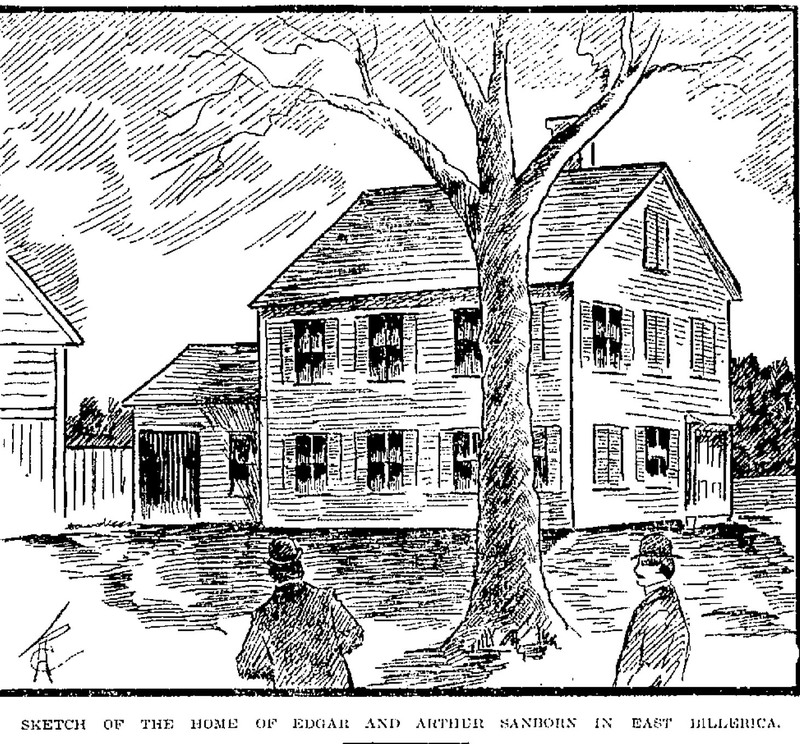 Upon arriving at his home, Sanborn sent Parker inside to retrieve two revolvers while he led Fleetwood into the woods. Surely, the next step or turn would lead to the treasure, Fleetwood hoped. They meandered near the train tracks. At last, they came to the barbed wire fence. ‘It’s right there.’ Sanborn told Fleetwood, pointing to a spot on the other side. Sanborn watched as Fleetwood slowly climbed the fence, carefully negotiating the handcuff attached to his wrist. At a precise moment, Sanborn shoved him and wrenched the loosely fastened handcuff from his wrist. Fleetwood landed with a thud as Sanborn escaped into the woods. Fleetwood fired one shot into Sanborn’s arm before Sanborn disappeared from view. 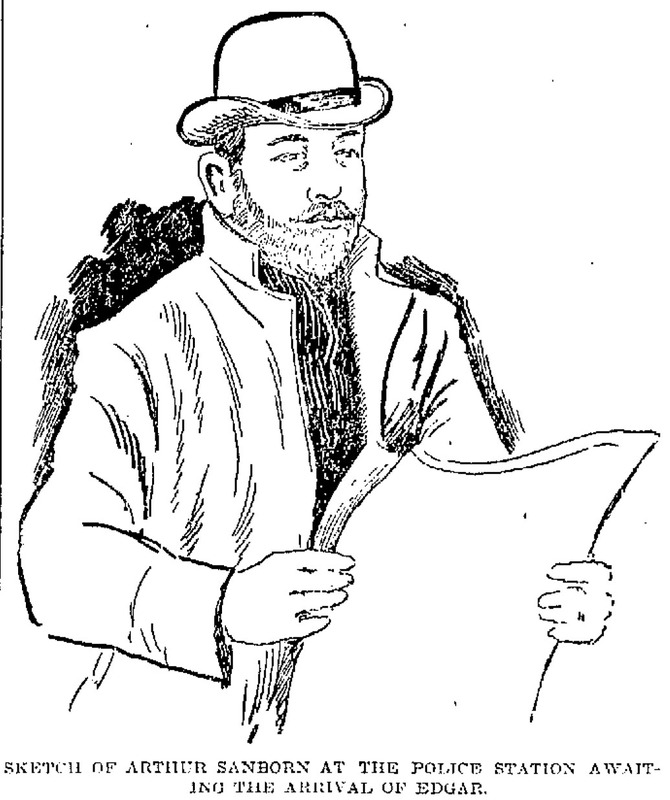 When Fleetwood did not return, Parker feared he had been murdered and uncomfortably reported to local police their surreptitious effort to return Sanborn to Massachusetts. A 24-hour manhunt through Billerica, Tewksbury, and Wilmington ensued. Ultimately, local officials found Fleetwood the next day, disgusted, tired, and perhaps ashamed, still in the woods, cursing his bad luck. Sanborn was found shortly after, at a friend’s house four miles away. That capture in Tewksbury presaged his third return to the Worcester Insane Hospital. His first had started after a standoff with his parents occurring during Christmas 1896. Lamps at the eyeglass peddler’s house on East Billerica’s Gray Street flickered brightly late one night. Inside, his grown sons, Edgar and Arthur Sanborn intendedly studied their Greek bibles, each trying to produce the best English translation. An argument about God’s nature ensued, each brother increasingly vexing the other. By the time Mr. and Mrs. Sanborn quietly stole worried glances into the room, their sons had climbed atop their chairs, flinging their books into a pile. Horrified, they watched as Edgar and Arthur jumped to the floor and began an “Indian dance” around the pile. At this, they intervened, trying to calm their sons. The men suddenly grew sullen, and secured the family’s two revolvers. Their parents stared in disbelief as Edgar and Arthur stood shoulder to shoulder, soundlessly, in the middle of the room, pointing their revolvers at their parents. Neither responded to their parents’ pleadings. Neither spoke at all. Hours began to pass. Eight Hours. Sanborn and his brother, Arthur, stared down their parents through the length of their revolvers. At dawn, the brothers weakened, allowing their parents to wrench away the revolvers. The respite was brief, however. The next night, their sons again experienced a fit of insanity, violently descending into their home’s cellar. There, with crowbars, they began digging twin three-foot deep pits. Were they graves? Their parents fled and contacted town constables, who rammed through the house’s door the next morning. Constables Livingston and Conway eventually subdued the men, after four hours, but not before the Sanborn’s dog tore Conway’s clothing and one Sanborn nearly bit off Livingston’s finger. Edgar Sanborn spent most of his life in insane asylums – Worcester first and Bridgewater later. Arthur too was committed to Worcester briefly, but never again fell afoul of the law. He lived on Gray Street with his widowed mother until her death in the thirties. He died in Boston in 1945. And the treasure? No further mention is made, prompting one to wonder if it still lies in Sanborn’s woods, which today are bucolic backyards in East Billerica. The east billerica woods…. is that ‘jones’ forest’? I’d love some history on that part of billerica. Any idea where to find it? This may sound crazy but I believe this is my grandparents’s home! I’m putting together a history of the house as a gift for my dad for his birthday (he grew up in the house). If you have any other information about the owners or history of the house, I would love it. Thank you so much!